Every year thousands of workers who drive for a living suffer injuries while on the job. An injury suffered on the job can end your career, leading to lost wages while also leaving you dealing with enormous medical bills and uncertainty about your financial future. The good news is that there are laws in place to protect you if you are the victim of an accident that occurred while working. When driving is an integral part of your job such as delivery drivers, truck drivers, etc. it carries a lot of risk. Anytime you get behind the wheel of any vehicle the opportunity to get seriously injured always exists due to an automobile accident. However, the risk of injury for drivers does not only exist in terms of vehicle accidents but also in the driver’s other job requirements such as handling heavy packages, equipment, and dangerous materials among many other risks. This can lead to numerous injuries that leave the driver unable to work, unable to pay the bills or the medical costs they have accrued. The most common injuries we see for professional drivers include: soft-tissue damage, broken bones in the arms, legs, chest, or face, head injuries, cuts and bruises, and really any other type of impact injury that will result from a car accident. Additionally we see some chronic injuries that are caused by repetitive movements and remaining seated for long periods of time such as back sprains and strains, carpal tunnel, neck strains etc. Also because many of these jobs involve lifting heavy objects, we see injuries such as cervical radiculopathy, herniated lumbar or cervical disks (in the back and neck), and other stress injuries. Driver injuries and whether or not you have a viable workers’ compensation claim is a very complex legal issue. 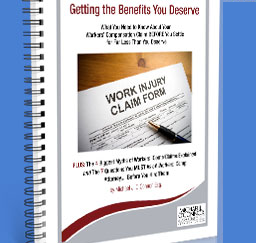 In order to have a workers’ compensation claim the accident and injury must be work-related. This sounds simpler than it actually is and can become confusing and frustrating without proper knowledge of how Pennsylvania’s workers’ compensations laws work. For example an accident on the commute to work is likely not going to be considered work-related unless other circumstances exist such as doing something that benefits your employer while on the commute to work. The attorneys for your employer’s workers’ compensation insurance company are certainly going to attempt to prevent you from getting your full recovery. It is best in this complex situation to contact a knowledgeable worker’s compensation attorney to make sure that you are not taken advantage of and have someone fighting on your side to maximize your recovery. In addition to having a workers’ compensation claim you may also have a civil claim if another party is responsible for the accident. Because of this you want an attorney experienced in both workers’ compensation and personal injury. When you are injured, unable to work (possibly permanently), and with growing medical bills you want to recover as much as possible. This means having the right attorneys on your side to get you the compensation you deserve. When injured on the job you will likely have a lot of questions about what to do next. The attorneys at The Law Offices of Michael J. O’Connor & Associates have the experience and knowledge in both workers’ compensation and personal injury to handle these complex legal issues. They will help you understand your rights under the law and work to secure the compensation you deserve.